In the coming weeks, there will be much discussion of what the “best screenplay” of 2012 is. The Avengers will probably be absent from that discussion. That’s a shame, because the screenplay for The Avengers is a startling model of precision, density and propulsive narrative. It manages to balance no fewer than ten wildly disparate main characters in its ensemble cast, but gives each of them weight, clarity and purpose. Dear readers, I’ve worked on many a comic-book movie, none of which ever got near production. Getting one superhero narrative to work is damn near impossible; The Avengers has a screenplay that soars with seven. What’s that blue cube in the picture up above? That’s the Tesseract. What is the Tesseract? Well, assuming the viewer has not seen Thor or Captain America, the answer is “Who knows?” But the Tesseract is the very first thing mentioned in The Avengers. It is, of course, the Maguffin of the narrative, the object around which the narrative revolves. That it has been mentioned in previous movies doesn’t matter. In a lot of ways, and this is an important concept, what the Maguffin of any narrative is doesn’t matter. It is “an object of consequence,” and that’s all you need to know. A deep voice intones: “The Tesseract has awakened.” What does that mean? Again, who knows? 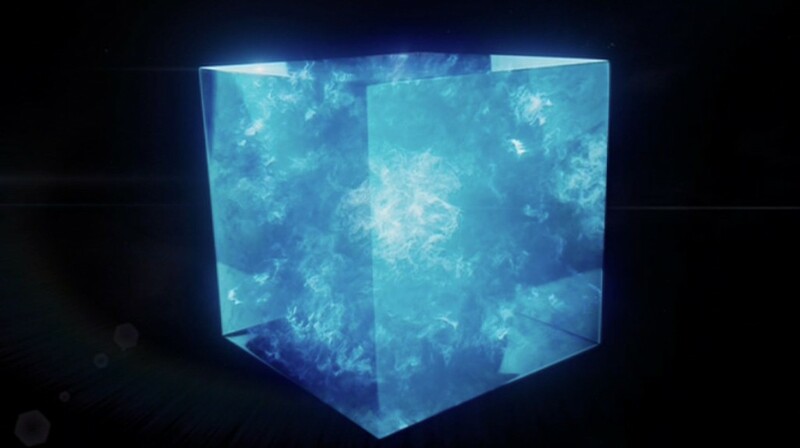 What’s important is that there is an object called The Tesseract, and it has awakened, and, based on the seriousness of the voice-over, The Awakening of The Tesseract is a grave event indeed. Okay, now who’s this guy, and where is he? Is he the guy talking? Who, or what, is he talking to? Like the Tesseract, it’s not so important that we “know,” only that we sense the scale and importance of events. 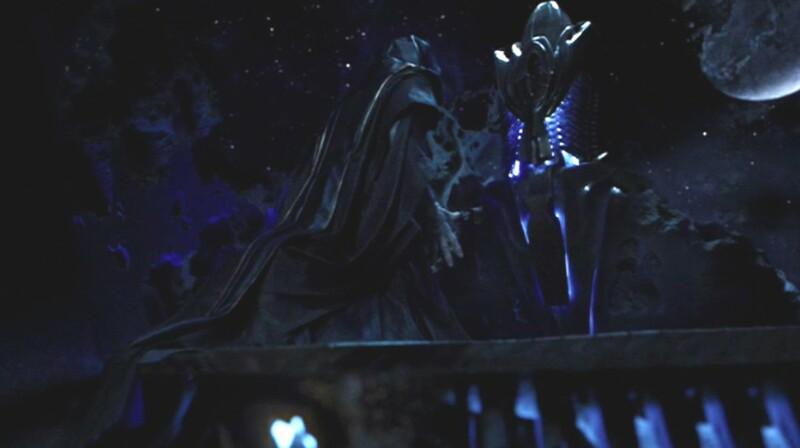 The guy on the weird platform talking to the celestial jukebox in the middle of outer space is swaddled in gigantic robes and is talking about Earth in alien terms in a deep, troubled voice to someone or something that is more powerful than he is. What we know now is that The Tesseract, whatever it is, has awakened, on Earth, and that that is a matter of concern to Mr. Bigrobe here, and to his boss on the other end of whatever this device is Mr. Bigrobe is talking into. Mr. Bigrobe mentions that the Tesseract is on Earth and that he is sending an “ally” to go fetch it from the humans who possess it. We then get a quick shot of Bigrobe handing some sort of glowing sceptre to this ally. So we have a chain of command in just a few short seconds: there is a mysterious “boss” somewhere, who Mr. Bigrobe reports to, and Mr. Bigrobe, for some reason, can’t go to Earth to get this all-important Tessaract himself, so he is sending an “ally.” The ally, we then learn, is not traveling to Earth alone. No, at some point in his task he’s going to be joined by an army of creepy-looking aliens called The Chitauri. The Ally is going to get the Tesseract, and for this he will be granted the Earth to rule, and the rest of the universe will fall under the control of this mysterious boss. The movie is less than a minute old, and that’s already a ton of narrative to digest. Too much, probably. Too much, definitely. No one could make any clear sense of what they’ve just been told. So what have we really been told? What we’ve been told, really, is that Big Doings Are Afoot, that forces beyond human comprehension are conspiring against us, and that humanity will, no doubt, be wiped out. In short, what we now have is “stakes.” Stakes are what give a narrative, or a scene, weight and import and volition. The Avengers is a maelstrom of stakes. So frickin’ psyched for this analysis. Just from these opening stills I want to say that this movie will have some theme of authority and tool-use: where do we get our orders from (Nick Fury : shadowy cabal :: Bigrobe : celestial jukebox, etc.) and what tools do we have to accomplish those orders (and “tools” here includes allies and other people). 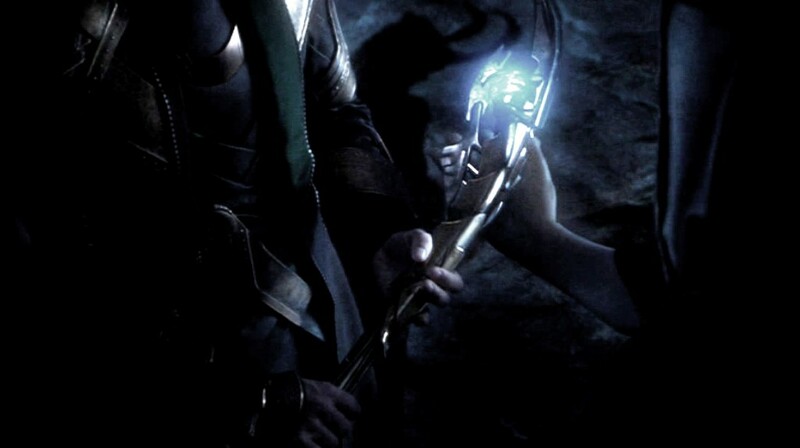 Part of that is me looking ahead to the movie, but part of it is what I’m getting from the angles on these stills–low shot emphasizing the power of the celestial jukebox, high shot capturing only hands and staff, the hand-off of power and authority. Oh, man, I’m glad you’re going to pick this one apart. After I saw the movie for the first time, I came out of the theatre saying that I wanted to sit down some day and figure out just how in god’s name it managed to integrate so many characters so well. Part of that, of course, is because each of those characters got their own movie beforehand; I can’t vouch for how well The Avengers works if you haven’t seen *any* of the individual prequels. But even with that, the movie could have crashed and burned so. easily. under the weight of all those protagonists. The fact that it doesn’t is astonishing, and I’d love to see how Whedon managed it. I had only seen Iron Man before The Avengers. I’m not a big comic reader, so not only had I not seen Iron Man 2, The Hulk, or Captain America, I was also completely unfamiliar with Black Widow, Hawkeye, and Agent Coulson. I had only a cultural knowledge of Nick Fury, Iron Man, the Hulk, Thor, etc (at least, as the characters have been developed after 1990 or so). I think it did a good job of integrating them well. I have my theories as to what went right, but it’s been a while since I’ve seen the movie, and I’m sure Todd will tell his own tales, so I’ll wait and read. Back in May, my wife was totally psyched to see ‘The Avengers.’ When I asked her if she wanted to watch ‘Thor’ and ‘Captain America’ beforehand, though, she looked at me like I’d asked her to play with Super Friends action figures. I have the impression that a LOT of people were excited by ‘The Avengers’ (both before and after seeing it) without having any particular interest in the rest of the Marvel movies. I think this is true. I saw all those earlier movies and enjoyed them well enough, but not only was I not moved to watch them again before seeing The Avengers, I haven’t been moved to watch them since. When does ‘Avengers’ part 2 get posted?!?! I’m sure you can find it somewhere around here.